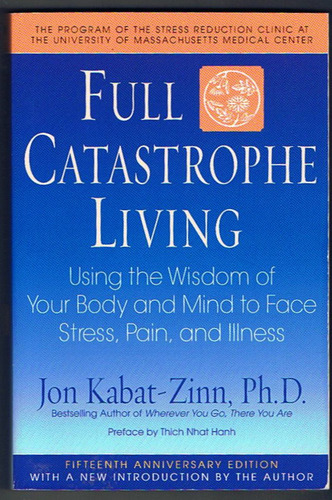 While my son was in the hospital this summer, I stumbled across the work of Dr. Jon Kabat-Zinn, a professor at the University of Massachusetts Medical School and founder of the Mindfulness Based Stress Reduction Clinic. Dr. Kabat-Zinn is credited with being the first person to make use of meditation as clinical practice in western medicine. According to Dr. Kabat-Zinn, the words meditation and medicine both come from the same Latin word: medeor, which means “to heal”. After listening to an on-line lecture and reading Dr. Kabat-Zinn’s book Full Catastrophe Living, I decided to start practicing mindfulness meditation. After almost two months, I can tell you that it has indeed been a “healing” addition to my daily self-care routine. More than any other single practice, mindfulness meditation was most helpful in getting me through the crisis of my son’s early and traumatic arrival into the world. My closest friends have remarked that I actually seem to be more relaxed than usual, in spite of my unpredictable circumstances! When I relax into the present moment and accept it as it is, I find that heaven and earth are indeed full of God’s glory! Sit still for three minutes, close your eyes, and try to pay attention to your breathing. Don’t breathe any differently than you normally do. You’re breathing all the time, whether you realize it or not. Just try to become aware of what is already happening without your conscious effort. Start with this and see what happens. How did you feel before, during, and after the exercise? Once you’ve done this once, try and do the same for five minutes a day. When you feel ready, increase that amount to ten minutes a day, then fifteen, then twenty, etc. Dr. Kabat-Zinn recommends practicing this exercise for 30-45 minutes every day (I’m only up to twenty minutes right now). After practicing, you might not feel any different than you normally do. That’s okay. The point of this exercise is to practice being rather than doing. It’s a healthy alternative to our culture’s constant pressure to “keep going” all the time. Many of us have forgotten the sound of silence and the feel of stillness. We identify so strongly with our activities and accomplishments that we lose touch with our true identity as beloved children of God. I recommend this exercise as a way of bringing us back to an awareness of who we really are.